Logins are case sensitive so please make sure you use upper and lowercase letters as provided as well as check the use of any special characters in your username and password. 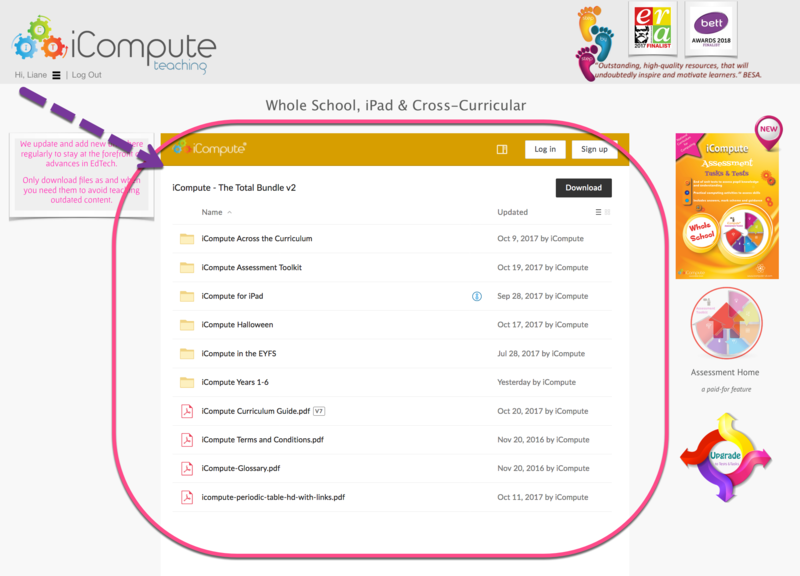 If you have successfully logged in but cannot see our folders and files in the middle of your screen (see image below) our domains are being blocked by web filtering. Where are the full plans for some iAlgorithm and iSafe units? Algorithms and eSafety are embedded in iCompute's schemes as we believe that computational thinking and being, safe, responsible digital citizens are fundamental to learning with and about technology. In addition to the comprehensive coverage we provide on these aspects of computing, we provide a small number of (free) units for additional learning opportunities - Eg. for schools wishing to also cover eSafety in PHSE or work on algorithms in Mathematics. These are produced by reputable third-party providers and we think they are useful additions to our schemes. As the lesson plans and resources for those units are provided by third-parties we do not charge for them nor distribute them. We have matched these units to the National Curriculum and provided assessment guidance for you. You can download the full unit plans and resources for those units by following the hyperlinks within the plan or the links contained in the Weblinks folder for each unit. The databases for iData are provided for your convenience in the format of a few popular database applications found in primary schools. You do not need these files in order to teach iData. You can use any database application, including Microsoft Access which most schools have access to. If your database application is different, or you are using another version of the database application we have provided the databases for, you will need to create a new blank database with the fields contained in ResourceLKS2.1.2c and manually populate the database yourself. This can be achieved by entering the records contained within ResourceLKS2.1.2c into your application as new records. We suggest you ask your pupils to enter one record each. This is not only great practise for them but also the objective of the third unit in iData. Please note that we assume that all schools have access to a database application as databases were covered under the previous National Curriculum for ICT. If you are struggling to find a database application you can use, please contact us and we'll do our best to help. Google Chrome handles some flash files in this manner and we therefore recommend that you use an alternative browser if you encounter this issue. All of the flash files we link out to are produced by highly respected providers, including the BBC and TES iBoard and are not harmful. As an alternative, you could download and install a stand alone Flash Player on your school network which would enable pupils to play the flash files locally without any internet connection. Download the lastest version of Flash Player Projector for your system here and change all downloaded files ending in .swf to be opened with Flash Player by default.